Whether you're losing weight for health reasons, to feel more confident at the beach, or to generally boost your energy levels, seeing results is key to staying motivated to stick to your fitness plan. The truth is, though, that the double-digit weight loss seen on many reality TV shows isn't reflective of what you'll see in real life or what's healthy for real-world weight loss. There are a couple measurements you can do at home to figure out if you're burning fat, or you can consult a professional to know for sure. A lower number on the scale is the major sign you're burning fat. The general rule is that every extra 3,500 calories burned leads to 1 pound of weight loss, and at least some of that will come from lost fat. Exactly how much weight loss indicates fat loss depends on your current body composition, according to Pamela Peeke, M.D., in an interview with Details magazine. If you're overfat -- meaning you currently carry too much excess fat -- each pound you lose will mean you've lost close to a pound of actual fat tissue. If you're lean, you'll lose a smaller proportion of fat for each pound lost. Regardless, if the number on the scale is going down, you're burning at least some body fat. In some cases, even significant weight loss won't trigger a major change on the scale. If you're toning up as you slim down, you might be packing on muscle tissue as you burn fat, which means you'll be reducing your body fat levels without seeing huge results on the scale. In that case, you'll know you're burning fat by looking at your body proportions. Your clothes will fit better, and you'll notice a loss of inches -- including in the region where you typically store fat, whether that's your hips, thighs, waist or arms. 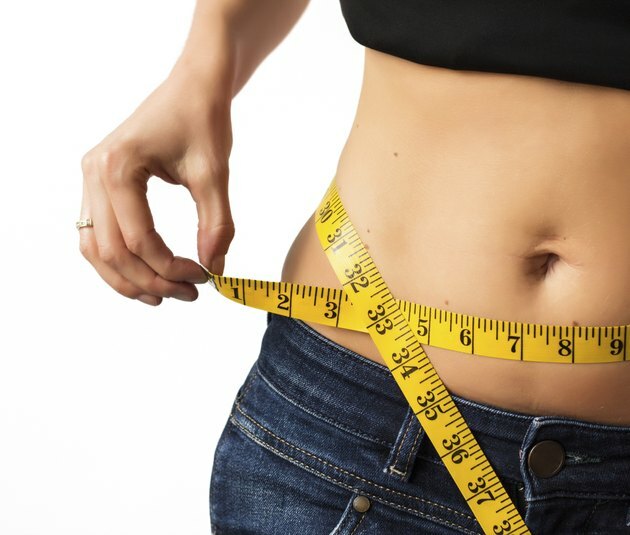 Losing inches can also benefit your health if you carry excess weight in your midsection. A waist size of over 40 inches for men or 35 inches for women indicates a higher risk of chronic diseases, like heart disease, so losing inches to take yourself under this threshold improves your health. Take your measurements once a week to keep track of your progress and look out for other aesthetic signs of fat burning: a slimmer appearance and more muscle definition. One accurate -- though somewhat inconvenient -- way to ensure you're burning fat is to get your body composition tested at a few points during your fitness journey. The results of a body composition test let you know how much of your weight comes from lean mass -- muscles, bones and other lean tissues -- and how much comes from fat. A few body composition tests allow you to see how your body fat levels change over time, so you can get an accurate measurement of just how much fat you've lost. Accurate body composition testing has to be done in a lab, however. It requires equipment you won't have at home, such as an underwater weighing apparatus, a BodPod or a DXA machine, a body image scanner that lets you actually see where fat is distributed in your body. You can also get a general measure of your body fat levels using an at-home scale that uses electrical signals to estimate your body fat levels to look for changes in body fat over time. But don't be discouraged if the numbers on your at-home scale don't indicate significant fat loss; these scales are highly inaccurate, according to the University of California at Berkeley. If you're losing inches -- or weight and inches -- those are good indicators that you're burning fat. Burning fat requires a healthy lifestyle, which means a varied, well-rounded diet that supplies healthy carbs, protein and fat, plus an exercise routine designed to help you lose weight. You can maximize fat burning by tweaking your diet to retain as much muscle as possible. You burn calories simply by maintaining healthy muscle tissue, so retaining your muscles keeps your metabolism high; keeping your muscle also means that most of the weight loss you see comes from fat. Preserve your muscles by strength training two or three times each week, selecting exercises that work every major muscle group: your abs, back and core, lower body and arms and include plenty of protein in your diet to provide nutritional support for muscle growth. Aim for slow, steady weight loss at a rate of 1 to 2 pounds per week. While this means it may take longer to lose your excess fat, it prevents your body from entering a semi-starvation state, where it will resist burning fat. Details: Do You Really Lose a Pound of Fat for Every 3,500 Calories You Burn? University of California, Berkeley: Body Fat Scales: Step Right Up? How Do I Know If I'm Gaining Muscle Weight or Fat Weight?